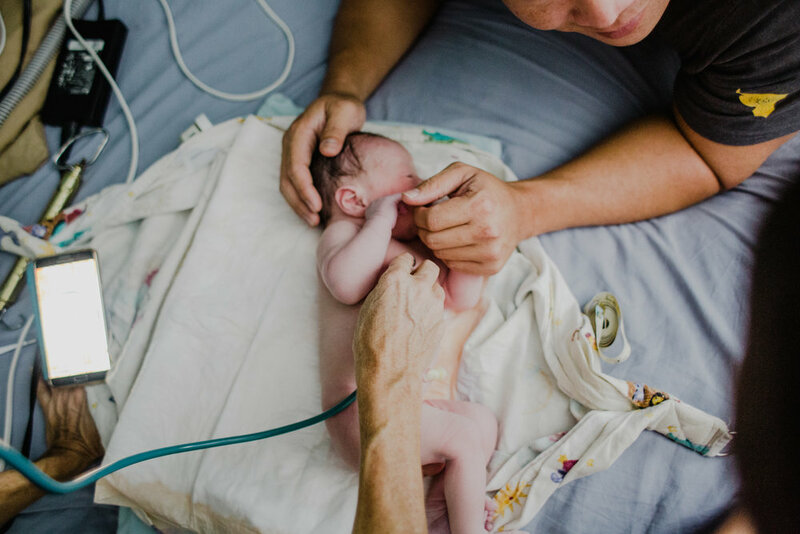 It was a whirlwind of a summer when this sweet family reached out to me that they love my work and asking to document the birth of their baby boy just weeks before his arrival. I only like to work with a limited number of birth clients each month so that my full attention and focus and time can be dedicated to them, so usually I would have said that I am unavailable. However, unexpectedly, one of my birth clients due at the same time had already had her baby leaving a last minute spot open. I always feel like my clients are guided to me in a special way, maybe by the love they have for their babies. And in this case too, I felt like it was totally meant to be. It was during this time that hurricane Irma hit south Florida. We wondered if baby would come before, during or after the hurricane and how the storm would affect our homes and the roadways leading to each other. It truly was meant to be as baby came happily on his own well after roads were cleared following the hurricane. I am so thrilled to share these images with you and I cannot wait to meet all of my 2018 families. I will be documenting birth stories from Orlando through Fort Lauderdale in the new year and if you are a newly expecting family, reach out to me and let's chat! I am meeting with expecting moms in November and December to reserve birthing stories with estimated due dates of January - August 2018. My partner Lena will document the most special moments of your pregnancy through a maternity lifestyle session in Boca Raton or Delray Beach, and even capture your first official session together either as a Fresh 48 in the hospital or a newborn lifestyle session in your home.